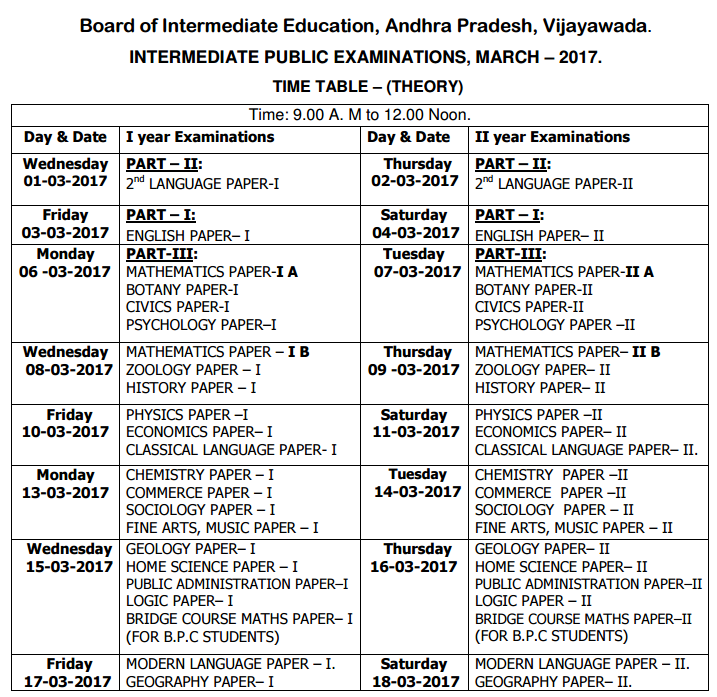 AP 1st /Jr Inter Previous Papers 2017 Download: In Andhra Pradesh intermediate exams are conducted by the board of intermediate education, Andhra Pradesh. It regulates and supervises the system of intermediate education and to specify the courses of study and matters connected with. A.p intermediate will conduct intermediate public examinations every year in the month of February and March. For this exam every year nearly 3lakh students are commenced to write public exams. Intermediate education board examination will conduct the public examinations in Telugu and English medium in all private and government colleges. PART- 2: TELUGU, SANSKRIT, HINDI, FRENCH, FRENCH, URDU, ARABIC. In these languages students can choose any one language. Part-1 English language paper-2 is common for all groups and this paper is for 100 marks. Part-2 second language paper-2 is given to the students according to their choice at the time of filling of application form. And this paper is also for 100 marks. For M.P.C & M.E.C group students mathematics paper 2a&2b are examine for 150 marks (75 marks each). For Bi.P.C students zoology paper-2 & botany paper-2for 120 (60 marks each paper contains). For C.EC students CIVICS paper-2 is for 100 marks each. H.E.C student’s history paper-2 is for 60 marks. For M.P.C, Bi.P.C student’s physicspaper-2 and chemistry pare-2 exams are examined for60 marks each. For M.E.C, C.E.C, H.E.C student’s economics paper-2 and commerce paper-2 are examined for 100 marks each. Physics and chemistry lab practices for 60 marks ( 30 marks each lab consist).these labs are common for both M.P.C &Bi.P.C. But for Bi.P.C ZOOLOGY & BOTONY LABS also examined for 60 marks (30 marks each). These practical exams are conducted before the public exams I jumbling system. And the time allotted for each exam is three hours (9:00a.m to 12:00p.m).